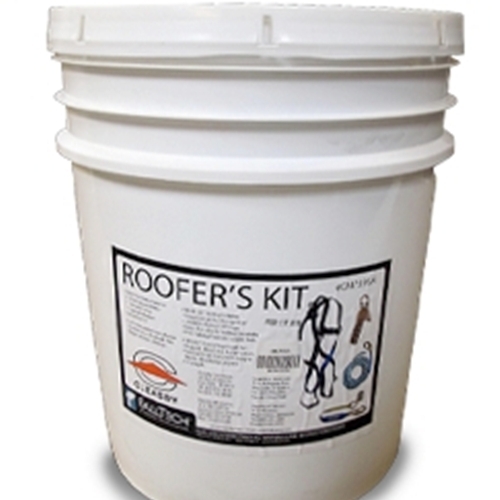 The Falltech Roofer’s Kit affectionately known as Safety in a Bucket is a favorite in our industry. Safety gear doesn’t get much easier than a one stop shop OSHA approved kit with protective bucket. The light weight 13 pound kit is easy to transport around the roof top work site, and easy to store in a truck, van or facility when not in use. The bucket ensures that the safety equipment is protected, and kept together all in once place. Simply grab and go for each day on the job! The Falltech S00033 kit includes the reusable standard plastic bucket, and OSHA regulated fall prevention equipment for one individual. The full body safety harness included in this kit is adjustable to fit most. The 50 foot poly Vertical Lifeline has a manual grab, and can tie off to the included reusable roof anchor. Lastly, the Falltech kit includes the shock rope grab set. Fall prevention may or may not be regulated per contract or OSHA guidelines on each specific job site, but this kit makes it so simple that it just cannot be ignored. Putting proper fall prevention equipment in place allows your crews to complete the necessary tasks while reducing the risk of an accidental fall. Browse the full line up of safety equipment from Cleasby, an industry leader with over 60 years experience in roofing equipment and related safety equipment. Protect your crews and your reputation, and avoid potential costly OSHA sanctions that could result from not having the proper equipment in place. It’ doesn’t get much easier than this full kit! Intech Equipment and Supply is available to take your order by phone, as well as to review selection and compare products and kits to ensure that proper coverage is provided. Browse online for top industry manufacturers including Roofmaster, Cleasby and more – To cover all of your bases from traditional roofing supplies, spray foam equipment, safety equipment and everything in between.